I finally took some photos. Over the last..some months.. I have been busy with everything besides using my camera. Motivated by..the heat of the recent 30 degree Melbourne day and wanting to get OUT of the house, I drove down to Docklands and snapped a bunch of photos…3 of which I present to you here.It was actually a bit educational as I learnt about some of the things in these photos..I.e that John Kelly sculpture.. It was a nice way to spend an hour or so wandering around on such an awesome Spring night. Click the photo to view larger ones @ my flickr site. Drove past this building, thought that it would make a nice backdrop for my car. 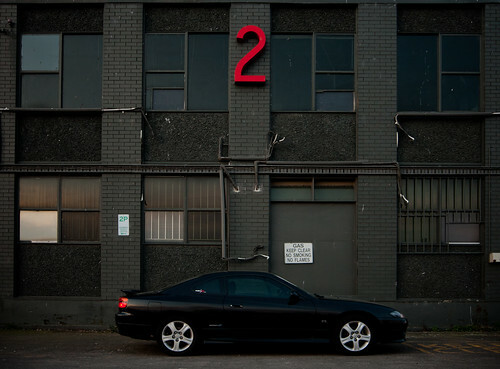 Somewhat related is the 2, the model of the car is a 200SX. Make of it what you will. This was located around the Docklands area. Cropped the sky off this one, this was around sunset. 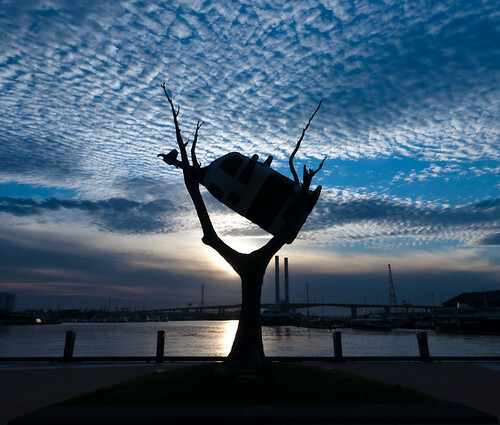 An art sculpture of a cow, up a tree which lives permanently in Melbourne’s Docklands precinct. It was made by John Kelly and was based around flood imagery from Australia. The sun was setting, and for some reason I like putting the sun behind things so here we go. Plus the sky was looking pretty cool… Initially this was a portrait oriented image but I cropped it a bit and adjusted some levels as well. 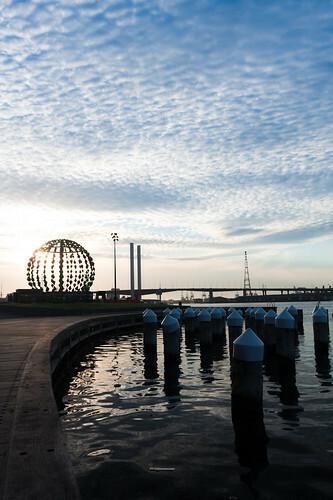 I haven’t been around Docklands for awhile, so i’m not sure if the silhouette of a large green and red ball is always there but it made it into this photo. I assume it might be there for Christmas..either way, I’d like to find out what the story is behind the pillars left in the water. I know the caps on them are to stop seagulls standing on them, but i think they’re just left over foundations of whatever used to be there. « I’m on the Dropbox Bandwagon.